Ashly Audio is introducing the first of its new, integrated products of the year at ISE 2019 (Booth 3-C104) as well as its new approach to integrated solutions that focus on helping AV and system integrators to install faster, troubleshoot more efficiently, and develop effective, long-term partnerships with their customers. 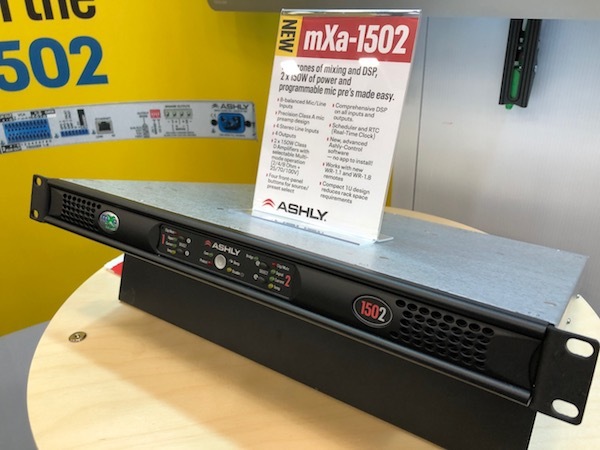 The first solution in Ashly’s next generation of pro AV products is the mXa-1502 Mixer Amp – an integrated product bringing four zones of mixing and DSP, plus 2 x 150W of power and programmable mic preamps, all made simple in a single, compact rack-mountable unit. The mXa-1502 is primed to help integrators win more clients among the small- and medium-sized business sectors of retail, hospitality, and house of worship. Integrators can deliver long-term assistance thanks to the mixer amp’s built-in web server, which offers a web-based control platform. If an end user requires assistance, an integrator can first login to the controls remotely online before rolling a truck out to the site. Further, the control system doesn’t require extensive tutorials or workshops to master. Ashly has put a focus on ensuring the most intuitive interface ever, with different levels of control for both the beginner user up to the integrator.